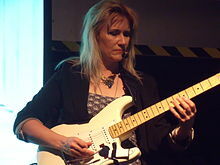 Jennifer Batten is an American guitarist who has worked as a session musician and solo artist. From 1987 to 1997 she played in all three of Michael Jackson's world tours, and from 1999 to 2001 she toured and recorded with Jeff Beck. She has released three studio albums: her 1992 debut, Above Below and Beyond (produced by former Stevie Wonder guitarist Michael Sembello), the worldbeat-influenced Jennifer Batten's Tribal Rage: Momentum in 1997, and Whatever, which was released on CD and DVD in Japan in September 2007 and worldwide in April 2008. Batten began to play guitar at the age of 8 when her father bought her a "killer red and blue electric". Her early influences were the Beatles, B.B. King, Lightnin' Hopkins, and Jeff Beck. Batten started to experiment with the two-handed tapping technique in 1978, having been inspired by Guitar Institute of Technology classmate Steve Lynch (who ended up playing for the band Autograph) while attending the Musicians Institute. Batten has appeared on recordings such as Jeff Beck's Who Else! (1999) and You Had It Coming (2001), and Michael Sembello's Heavy Weather (1992). Her music video appearances include Jeff Beck ("Live in Japan"), Michael Jackson's "Moonwalker" ("Come Together"), Natalie Cole ("Wild Women Do"), and Sara Hickman's "Take It Like a Man" and Miguel Mateos's "Obsesión". Batten played lead guitar and rhythm guitar on Michael Jackson's Bad (1987–1989), Dangerous (1992) and HIStory (1996–1997) world tours, and on his 1993 Super Bowl halftime performance, which was aired to over 1.3 billion people in 86 countries, the largest audience in television history for a live music performance. She was in Jeff Beck's touring band for three years starting in 1999, and appears on his albums Who Else! (1999) and You Had It Coming. Between 1994 and 1999 Batten worked with Dave Rodgers and Domino as featured guitarist on the Eurobeat songs "Sun City", "Music For the People", "Fly" and "Woa Woa Woa." Her writing and performing is uncredited on several other songs under the A-Beat C label. Her live Eurobeat appearances were limited to playing at the Tokyo Dome with Rodgers and Queen of Hearts. In 2010 she recorded a solo for the song "Bad Girls" by Polish singer Doda. She partnered on a melodic rock CD with vocalist Marc Scherer and producer Jim Peterik (formerly of Survivor) which was released in September 2017, entitled BattleZone. All songs were written or co-written by Peterik. Special guests included saxophonist Mindi Abair and Chicago vocalist Bill Champlain. The song "Space and Time" was co-written with Jon Wetton, and "All Roads" was co-written with Sammy Hagar. Batten made videos for all songs on her YouTube channel. Batten has written two music books: Two Hand Rock (published by Hal Leonard) and The Transcribed Guitar Solos of Peter Sprague (self-published). She also has three DVD/download courses available from TruefireDOTcom: "Rock Sauce for Lead Guitar", "Rock Sauce for Rhythm Guitar", and "50 Ultra Intervallic Guitar Licks You Must Know". In November 2011, Batten was featured on BBC Radio 4's series Joan Armatrading's More Guitar Favourites. Her work was given the "She Rocks Icon Award" in January 2016. Batten enjoys creating stained and fused glass art, and steampunk art. ^ Saulnier, Jason (23 July 2008). "Jennifer Batten Interview". Music Legends. Retrieved 3 July 2013. ^ a b c "Jennifer Batten Interview". Guitarhoo!. October 23, 2005. Retrieved March 10, 2013. ^ "Media overstates global appeal of the Super Bowl". humankinetics.com. Retrieved May 11, 2017. ^ "Washburn Artist Jennifer Batten". Washburn Guitars. This page was last edited on 8 April 2019, at 00:19 (UTC).